User Management—The JSS now allows you to view and manage user inventory information. VPP-Managed Distribution—Apps and eBooks purchased through Apple’s Volume Purchase Program (VPP) can now be assigned to users for VPP-managed distribution. Device Enrollment Program—After the JSS is integrated with the Apple Device Enrollment Program, you can use the JSS to configure enrollment and setup settings for mobile devices and computers using a PreStage enrollment. In addition, you can use PreStage enrollments to customize the user experience of the Setup Assistant. Casper Focus enhancements—Casper Focus updates include a redesigned interface and the ability to focus mobile devices on a website. In addition, you can now exclude a device from a class temporarily if you do not want the device to receive focus actions. Activation Lock Bypass support—When viewing management information for a mobile device, you can now view the Activation Lock bypass code for the mobile device. The Activation Lock bypass code can be used to bypass the Activation Lock associated with a mobile device. Apple Configurator Enrollment—You can enroll mobile devices with the JSS by connecting them to a computer via USB and using Apple Configurator, an enrollment URL, and an anchor certificate that you download from the JSS. Improved connection speeds for Casper Remote—To improve connection speeds, Casper Remote will first attempt to contact a computer using the computer’s reported IP address. The IP address reported by Tomcat will be used as the failover. Security enhancements—Options have been added for validating software distribution packages using checksum. In addition, user-initiated re-enrollment of computers can now be restricted to authorized users. 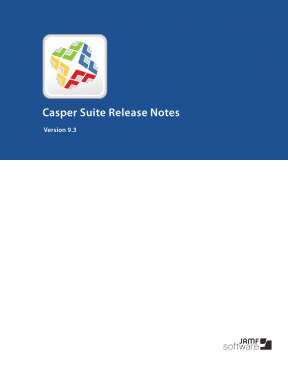 Learn more about the Casper Suite version 9.3, which now offers user management, VPP-managed distribution, and the Device Enrollment Program (DEP).